If you’re working with different currencies in one Excel spreadsheet, you’ll need to change the currency symbol on certain cells, without affecting other cells. 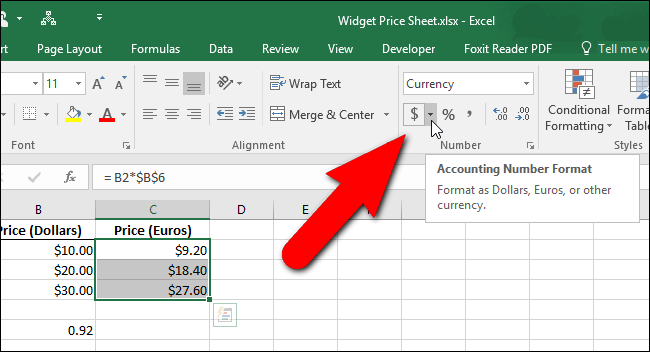 When you format your numbers as “Currency”, you can easily use multiple currency symbols in the same Excel spreadsheet. NOTE: If you’re going to use the same currency symbol throughout your Excel spreadsheets, you can change the default currency symbol throughout Windows instead. This is for situations when you want two different currency symbols in the same document. Before you do anything else, make sure the numbers in question are formatted as currency. To do this, select the cells you want to format. Then, select “Currency” from the “Number Format” drop-down list in the “Number” section of the “Home” tab. 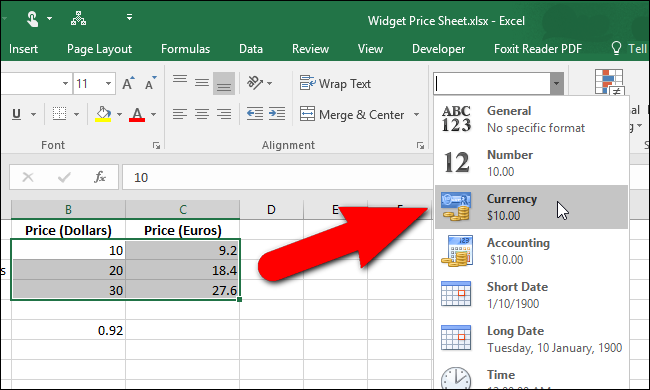 The numbers in the selected cells are all formatted as currency with Windows’ default currency symbol applied. 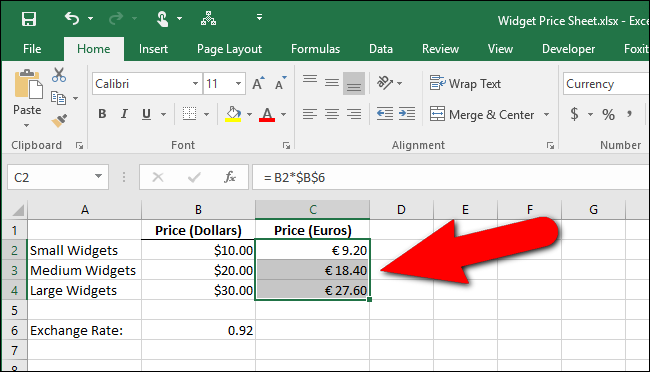 To change some of the currency numbers to another type of currency, such as Euros, select the cells you want to change. In the “Number” section of the “Home” tab, click he “Number Format” button in the lower-right corner of the section. On the “Number” tab, “Currency” should be selected in the “Category” list. Click on the “Symbol” drop-down list, scroll down to the “Euro” options and select one, depending on whether you want the Euro symbol before or after the number. Click “OK”. The selected numbers now have a different currency symbol applied to them. You may have noticed a drop-down list in the “Number” section of the “Home” tab that has a currency symbol on it. 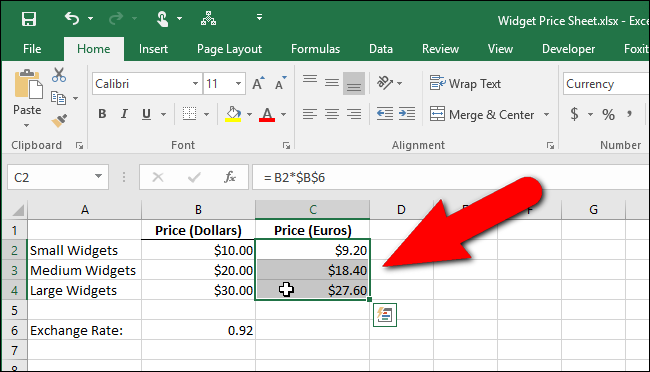 This may seem like an easier way to change the currency symbol for the selected cells. However, this is the “Accounting Number Format”, not the standard currency format. 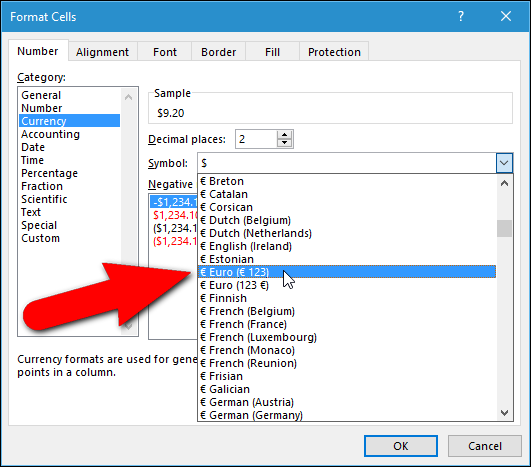 …you’ll get Euro symbols on your numbers, but they will display in the accounting format, which aligns the decimal points in a column. Notice that the currency symbols are not right next to the numbers. Instead, they are left-aligned. You can also change the number of decimal places and the format of negative numbers on the “Number” tab on the “Format Cells” dialog box.